potato | KBK Bakery's Adventures in Baking! 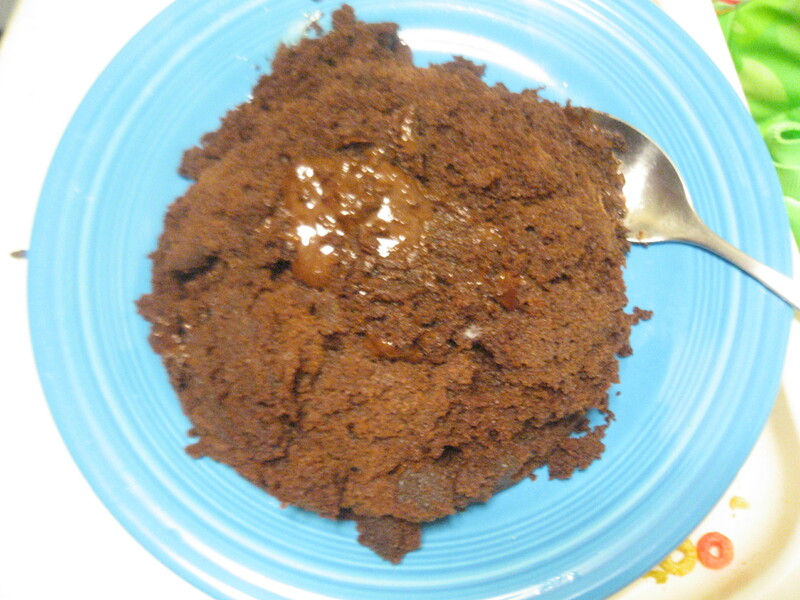 Well, I’m participating in, yet another, online baking event! This one is Homegrown! It is being hosted by the lovely Tempered Woman and the ingredient she chose for this month is the potato. The idea behind Homegrown is to make a dish that follows the theme and that somehow represents their home region – town, state, area and your dish can feature a local ingredient, be a traditional dish from your area, or be a creative twist. 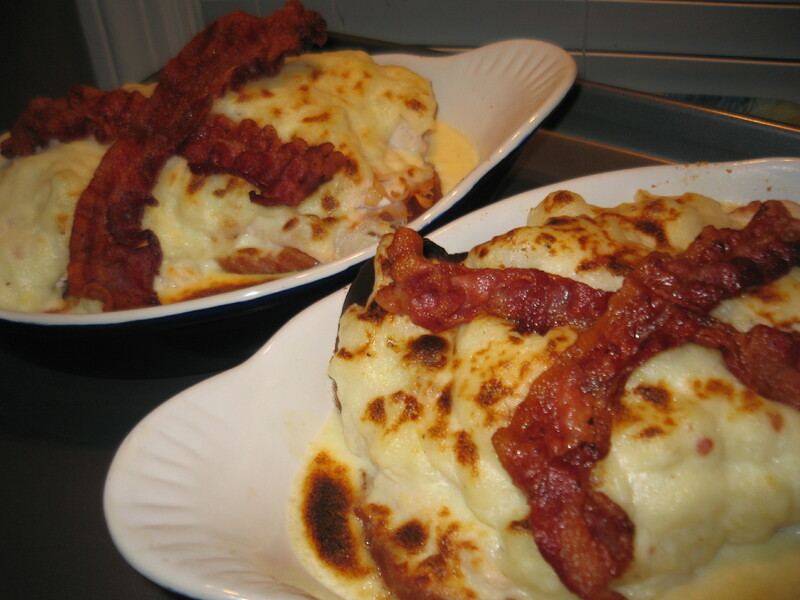 The recipe for a traditional Hot Brown from the Brown Hotel can be found here along with some history here. For my Potato Hot Brown I made a few changes. For starters, my bread is a homemade potato bread. The recipe for it comes from a cookbook (that I stole from my mother) that is older than I am. I think it was a wedding gift for my parents, heh. Yeah, I’m going to hell. I’ve made this bread many times and it was actually the first bread I ever made. 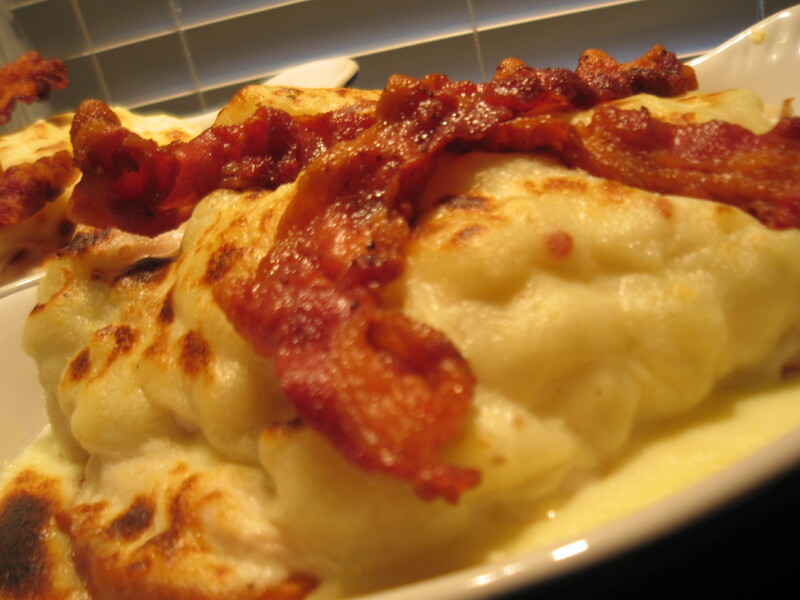 I’ve also added mashed potatoes to my Hot Brown, because, well, everything is better with mashed potatoes!! To liven them up and make them feel “part of the dish” I’ve added some of the sauce, pimentos, and bacon to them. (I know. The hardship of having to eat it, but I’ll persevere.) I also got my wheat (had a friend grind it for me), bacon and eggs from a local farm. I used a 5 lb. bag of Idaho potatoes (I like leftovers) and all but 4 pieces of bacon for the mashed tatters… every thing’s better with bacon! I’ve always thought the original Hot Brown a little on the bland side, but I think with the addition of the potatoes and the potato bread give it an extra twang of flavor; it’s simply perfect! Here’s the recipe! Happy munching! 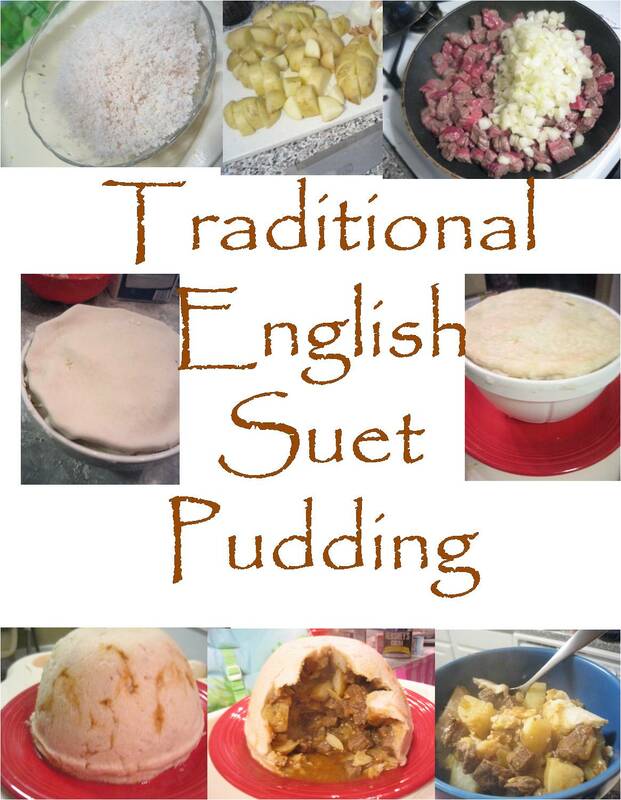 In a small bowl, beat egg. Gradually add 1 cup of the hot sauce, 1/3 cup at a time, to the egg, stirring constantly to temper. Gradually add egg mixture to remaining sauce, stirring constantly until well blended; add salt and pepper to taste. Fold in whipped cream. For each Hot Brown sandwich, place two slices of toasted bread on a metal (or flameproof) dish. Cover the toast with mashed potatoes and a liberal amount of turkey. Pour a generous amount of sauce over the turkey. Sprinkle with additional Parmesan cheese. 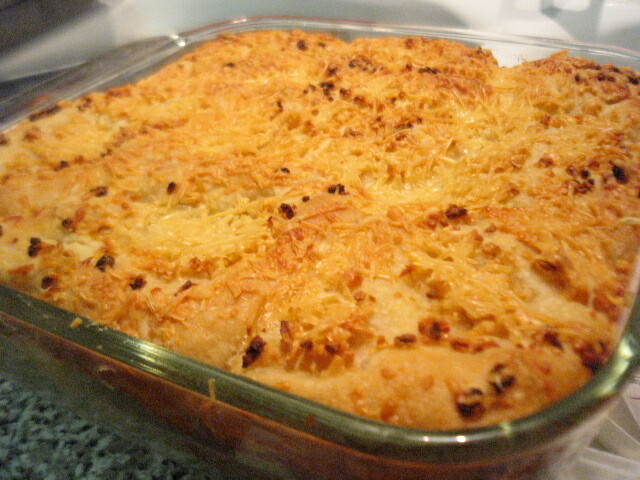 Place entire dish under a broiler until the sauce is speckled brown and bubbly. 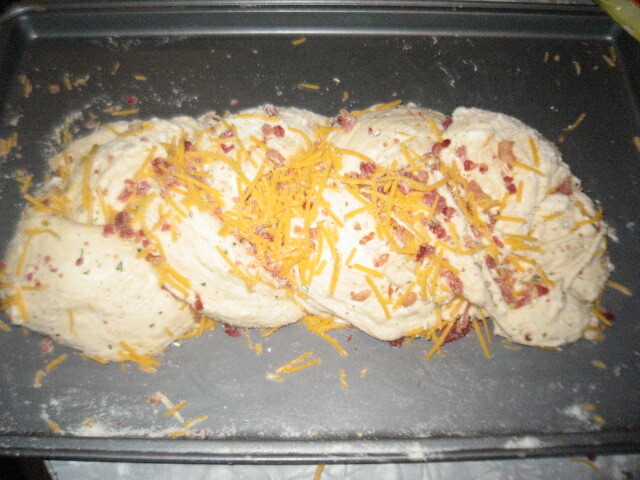 Remove from broiler, sprinkle with diced pimientos, cross two pieces of bacon over the top, and serve immediately. Makes 8 servings of two open-faced sandwiches each. This makes a moist, beautifully textured bread with good keeping qualities due to the potatoes. Mash the hot, unseasoned potatoes and add the butter or margarine, sugar, and salt. Pour in the scalded milk, and stir to blend ingredients and melt the butter. Cool to lukewarm. Now dissolve the yeast in the lukewarm water and stir into the potato-milk mixture. Stir in 3 cups of the flour and beat until smooth. Gradually blend in the rest of the flour to make a medium dough. Turn dough out onto a lightly floured breadboard. Knead for 5 to 7 minutes, or until dough is smooth and elastic. Place in a buttered bowl, brush top of dough with melted butter or oil, cover the bowl and let rise until doubled. When dough has doubled, punch it down and turnout onto a floured breadboard again. 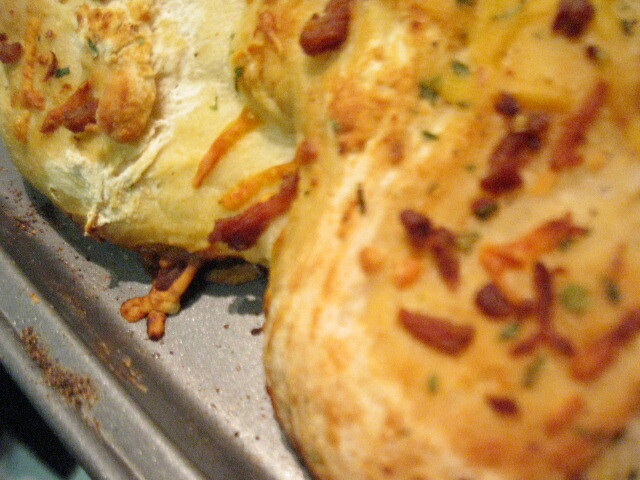 Divide dough into 2 parts. Cover with the towel again and let rest for 10 minutes. 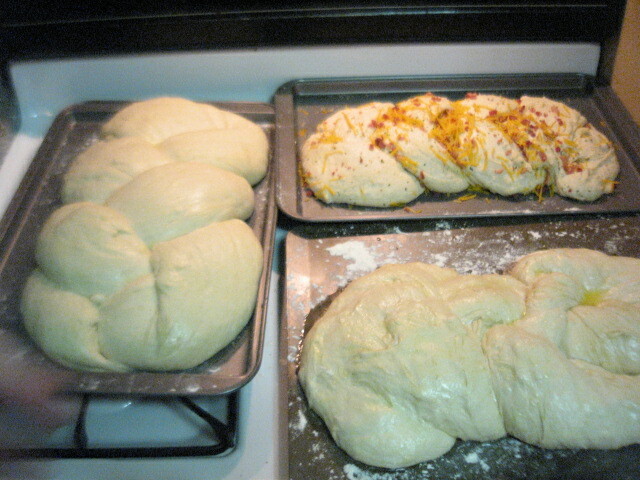 Then mold and shape the dough, with the hands, into 2 loaves. Place in 2 buttered loaf pans. Cover and let rise until double again. Brush with beaten egg white glaze (p. 348 ) and sprinkle with poppy seeds. Bake in a 400°F oven for 10 minutes and then reduce heat to 350°F and bake for another 40 to 45 minutes. 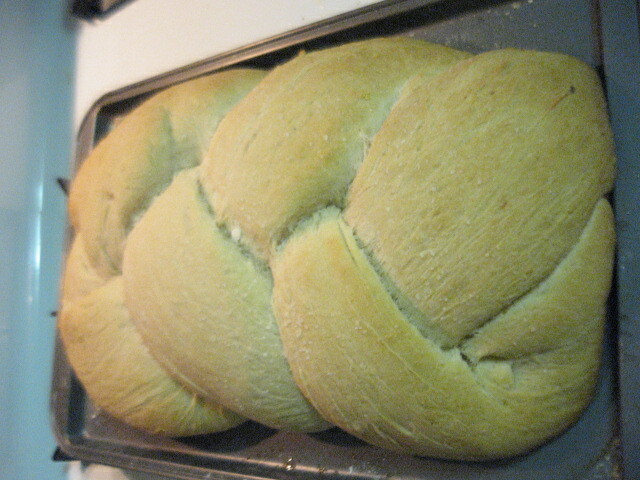 To make the loaf into braids, as suggested in the title, but the dough, after the first rising period, into 2 parts. Cut one part into 3 equal pieces and roll out into strips about 18 inches long. Braid these 3 strips together, tucking the ends under. Place on a lightly buttered cookie sheet. 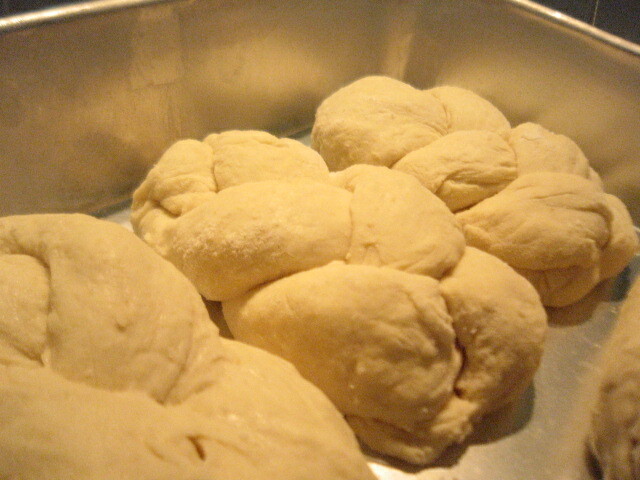 Now divide 2/3 of the remaining part into 3 equal pieces, roll out, and braid as above. Place this braid on top of the first braid. 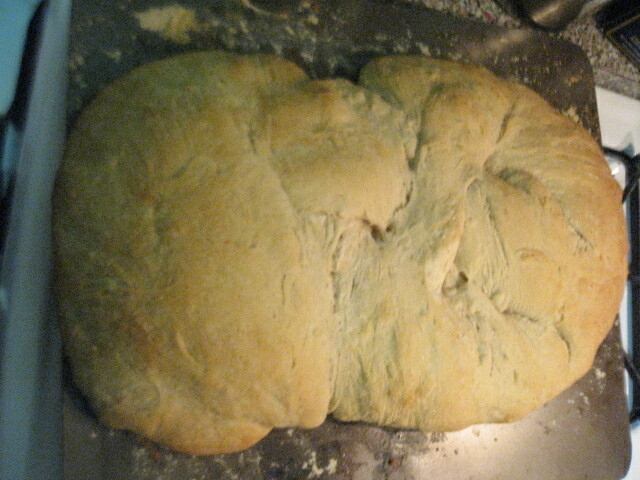 Now, take the remaining piece of dough and roll it out, twist it, like a curlicue, and place this twisted strip of dough on top of the uppermost braid. If you think it necessary, seal the ends with a very little water. Carefully cover the braided loaf, being careful not to disarrange the braids, and let rise until completely doubled. You must not cheat by even 5 or 10 minutes. Reduce heat to 350°F and bake until bread is well browned and done, approximately 45 to 50 minutes longer. 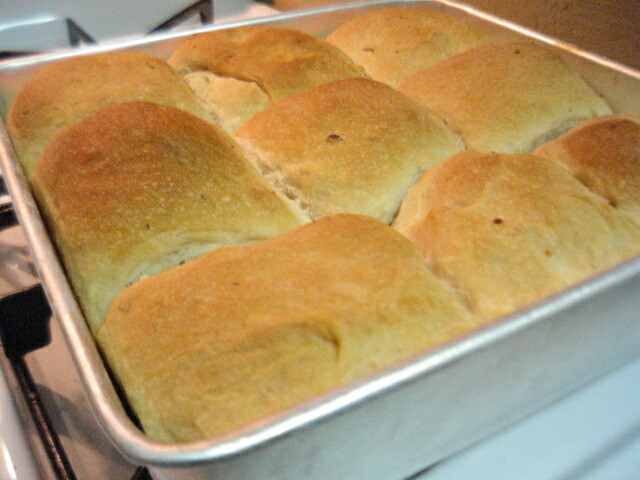 Note: this bread also makes delicious, and very attractive, rolls. Cut or shape into whatever shapes you desire, brush with egg white glaze and sprinkle with poppy or sesame seeds. When rolls are doubled, bake them at 400°F for about 20 minutes. From A World of Baking by Dolores Casella. Published 1968 by David White, Inc. Recipe is on pages 315-316.